Benzodiazepines are among the most widely prescribed psychiatric medications in the Western world, especially in the United States. Drugs like Klonopin (clonazepam), Xanax (alprazolam), and Valium (diazepam) have been on the market since the 1950s at least, treating anxiety and panic disorders, insomnia, and occasionally seizure disorders. The drugs work quickly, hitting the gamma-aminobutyric acid (GAMA) receptors in the brain and reducing how fast neurons fire to communicate. This leads to feelings of calm, relaxation, euphoria, and sleepiness or drowsiness. An analysis of benzodiazepine prescriptions in the US in 2008 found that about 5 percent of US adults, ages 18 and older, had filled at least one prescription for any benzodiazepine medication, so these drugs are widely available. They are often combined with opioids, alcohol, or both, which increases the intoxication from these drugs and can rapidly cause an overdose. In 2013, 30 percent of prescription overdose deaths involved benzodiazepines, making them the second deadliest prescription drug; opioids ranked first. These statistics, of course, reflect the availability and danger of just the benzodiazepines that have been approved by the Food and Drug Administration (FDA) for prescription use in this country. Since 2012, online stores have offered a dangerous new psychoactive substance (NPS) in the form of designer benzodiazepines. These potent, untested, and unregulated drugs have caused thousands of overdoses and deaths all over the world. Much like bath salts and synthetic marijuana, designer benzodiazepines’ side effects are unpredictable and last for a long time. Even a small dose can lead to severe reactions. The chemical formulas for designer benzodiazepines were discovered decades ago, but they were not approved for testing, production, or prescription use. However, like other NPSs, the formulas have been taken from online resources, reproduced in clandestine laboratories, and then sold online. Although they have not been approved for consumption in the US, they are not tightly regulated, either. The ease of purchasing these illicit, harmful drugs is leading to a spike in overdoses and deaths. One of the newer benzodiazepines, clonazolam, is becoming popular among polydrug abusers. One of these dangerous designer benzodiazepines is clonazolam, which is allegedly a potent combination of clonazepam and alprazolam, both of which are approved for short-term prescription use. This short-acting, long-lasting drug was originally synthesized in 1971, and it is approximately 2.5 times more potent than Xanax. Reportedly, about 0.5 mg of clonazolam produces intense sedation and amnesia. The drug is sold exclusively through illicit online retailers, and it is usually taken on blotter paper or in liquid solutions, much like LSD. Although the powder can be found online, the drug is unsafe in this form; ingesting it through the nose, either snorting on purpose or accidentally inhaling a dose, can cause at least a multiday blackout, if not an overdose, respiratory depression, and death. The drug may also be found in tablet or pellet form, which moves the substance through the digestive tract, releasing it more slowly, but causing the substance to be bioavailable for longer in the body. Clonazolam’s risks are like those of potent opioid drugs, like fentanyl or carfentanil. 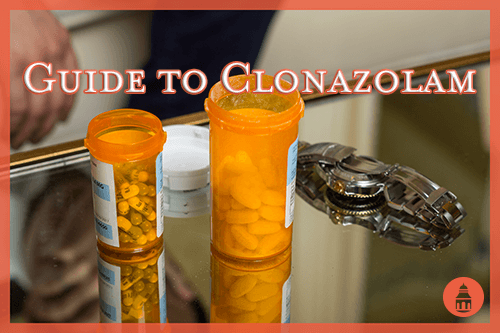 Onset of clonazolam’s effects begin 10-30 minutes after it is consumed and last for 6-10 hours. This makes it a medium-acting benzodiazepine, but taking more than 0.5 milligrams puts one in severe danger of suffering effects for more than 10 hours. Although taking any amount of clonazepam is very dangerous, abusing benzodiazepines in large doses can lead to life-threatening withdrawal symptoms. Clonazolam in particular leads to this risk because it is so potent already and can quickly lead to physical dependence. People who abuse clonazolam are more likely to be polydrug abusers, mixing this benzodiazepine with either hallucinogens or stimulants and leading to a cycle of abusing uppers and downers to moderate psychotic effects from the primary drug. Like other benzodiazepines, abusing clonazolam can cause physical and cognitive side effects that may last for a few hours. Because clonazolam is so potent, the body may build up a tolerance to and dependence on this illicit benzodiazepine within one week. This makes it harder to withdraw from clonazolam than many other benzodiazepines, so one may be at risk of abusing the drug long-term and suffering chronic illnesses as a result. Generally, people who take a prescription benzodiazepine have an underlying anxiety or panic disorder that may require a fast-acting medication to soothe intense panic. However, most physicians and therapists do not prescribe any benzodiazepine for longer than two weeks since the body will develop a tolerance to the drug, and the person taking it may start to feel like they need more to achieve the original dose’s effects. At the same time, the person will feel like they need the benzodiazepine to feel normal or to avoid the negative experiences associated with their anxiety disorder. Many of the withdrawal symptoms for most benzodiazepines mimic the original mental condition’s symptoms, so it can be uncomfortable to suddenly stop taking these drugs. The rebound anxiety and insomnia associated with benzodiazepine withdrawal mean that many people continue abusing these drugs long after they should have stopped. If they are no longer able to acquire a prescription from their therapist or physician, they may turn to the Internet for illicit benzodiazepines, including clonazolam. Trying to quit abusing potent benzodiazepines like clonazolam may trigger benzodiazepine withdrawal syndrome (BWS), a form of post-acute withdrawal syndrome (PAWS) that can have life-threatening side effects. Even a little discomfort from withdrawal may cause one to relapse back into benzodiazepine abuse. – with a potent, unpredictable chemical like clonazolam, this can rapidly cause an overdose. Overdoses on benzodiazepines can be treated with flumazenil, which reverses benzodiazepines’ effects. However, a person overdosing on clonazolam may not react to standard emergency room doses of this overdose-reversing drug. Designer benzodiazepines like clonazolam are new and very dangerous, but addiction specialists have vast experience working with people to overcome prescription benzodiazepine abuse. The techniques learned from working with prescription benzodiazepines can translate to designer benzodiazepines. Medically supervised detox followed by an evidence-based rehabilitation program make up the foundation of drug or alcohol abuse treatment. The detox process will most likely involve replacing illicit clonazolam with Valium or another long-acting benzodiazepine for a few weeks. During this time, a physician will work with the individual to slowly taper the amount of Valium they take until their body no longer relies on the presence of a benzodiazepine to produce neurotransmitters, and the physical effects of the withdrawal process are gone. Once detox has been completed, a rehabilitation program will offer group and individual therapy to alter behaviors around drugs and alcohol, prevent relapse, and create a drug-free daily routine. What Is Candyflipping and What Are Its Effects? Is Spice Legal in California? What Is Spice? Can It Be Abused?